Home Lifestyle Running in Moscow – A Photologue! Last 25 months of running I have not gone to any place without my running shoes! My in-laws live in Muzzafarnagar – the city of goons. My act of running there might lead to riots. But the perpetual, ridiculously optimistic me hopes to run there too one day! I may just inspire a group of women there to take up running – I sometimes day dream about it! I might just do it one day! This is what running does to most of us – Makes us fearless! Doesn’t running also mean freedom, joy – pure and simple? But for now let’s shift the focus to the Oh-so-cold, liberated, socialist Moscow! Moscow on a sunny 11 am is a dream at best! So after I spent doing Yoga mixing the best of my yoga poses with the socialist grandeur – Here’s the link – http://wellthyfit.com/fitness-yoga-guide-to-moscow-yogini/ it was time to run in Moscow! I decided to get to the running part via metro! And this is how beautiful the metro stations there are! Moscow has the most efficient, cheap and fast metro line in the world! The even more amazing or unique part about the Metro is the beautiful decor of the metro Stations! They are as deep as 100-200 meters. Back in the 1930s they were made for the dual purpose of transport as well as bunkers for the First World War! I covered two stations and got to a park at the waterfront – Park Kulturi – built in 1955 – an amazing park that has the waterfront, two big bridges, an up and down rolling hill and loads of runners even at -3 degrees! Yes it was 11 am and it was -3 degrees! I started running from Park Kulturi Metro Station to the bridge and down to the Waterfront! Met many runners well-clad to face the winds at the waterfront! It feels so good to see your tribe anywhere and everywhere in the world! Gorky Park is another place in Moscow to go run, also the Sparrow Hills is beautiful for the same. I chose Park Kulturi mainly because of the Mosqwa River flowing by it. Getting out of the Delhi region to run in a place like Moscow was heavenly. I am not going to get into the feeling safe part – That of course is a huge bonus, nobody cares who you are etc etc. For me – the waterfront, the clear blue skies, loads of sun, many happy runners around is what brings me happy feet rhythm! I did come back to Park Kulturi yet again for another 5k before I took my evening flight to Delhi! 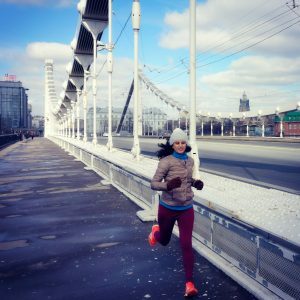 What’s the big deal with running in Moscow? Amazing clean and fresh air, a different route, infact many different routes, a climate that is perfect for running and finally a great way to enjoy the magnificence of Moscow! See you from another village, city, trail, country, soon!